Pupils at a Wigan special school were given an introduction to business as they turned fivers into fortunes to help homeless people. The Hope School put on an enterprise week where each team had to transform their modest start-up fund into as much money as possible in just five days. The business-savvy youngsters used an array of techniques and products to come up with an impressive total of around £900 for homeless charity The Brick. 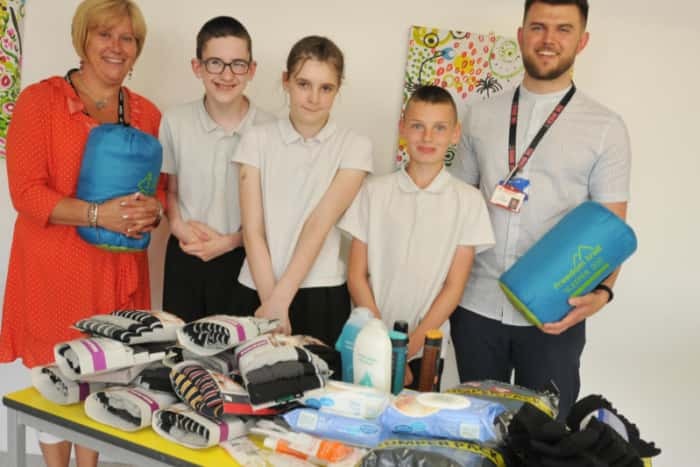 Following a conversation with the organisation based in Wigan town centre the school then converted the cash into a mountain of vital items for its work, including clothes, toiletries and even sanitary objects. The Hope School assistant head teacher Helen Leach said: “I’m very proud of them. They have really enjoyed it. “After we’d raised the money we rang The Brick and they told us they were desperate for men’s socks and underwear, ladies’ underwear, sanitary towels, razors, toothbrushes, deodorants and shower gels. The challenge involved students aged 12 to 16, with five groups in total taking part. The most popular scheme, which brought in £460, involved setting up a car boot sale and using money charged from stallholders to make hot dogs. They got an extra boost as kind-hearted staff at Sainsbury’s donated much of the food for free when the Hope group told them what they were doing. The other businesses included making bacon sandwiches for the school’s teachers, taking unwanted bottles from a pub and filling them with lights to sell as unusual ornaments, baking cakes and running a tuck shop. Each group was presented with a certificate in a special assembly and the pupils were all highlighted for the things they had done particularly well. The Brick is Hope School’s local charity and the focus of all its Wigan-based fund-raising, with one class recently making a sculpture out of tinned food which was then donated. The students also help out those further afield courtesy of its international charity partner, which is a school in Africa.